I liked Forest Camp (pedigree), too -- a son of star broodmare sire Deputy Minister, out of a Princequillo-line mare, from the 19-b female family of the blue hen Bimlette (all of these are great ingredients in a stallion's five-cross pedigree). Forest Camp now covers mares in... South Korea. South Korea! Stroll (pedigree) is another recent loss for American breeders: he's by one of A.P. Indy's most promising sons (and A.P. Indy sons are going to become increasingly important as the Lane's End stallion ages). And even better, that son is Pulpit, who is out of a mare from the amazing Claiborne Farm foundation family 2-f that dates back to Monarchy, a full sister to Round Table. Stroll also has some intriguing lines on his bottom side, with his Family 1-k dam Maid for Walking descending from Tudor Minstrel with crosses of Hyperion (GB) and Djebel (FR) and Bois Roussel (FR) and Caerleon (GB) in her five-cross pedigree. Stroll now stands in Italy. 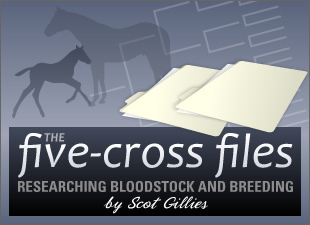 It's a shame to see promising sires heading across the ocean, far away from the reach of most U.S. breeders. Of course, without bloodstock imports and exports, the breed would never have come in to existence -- and never would have made its way to the U.S. shores. But certain losses are harder to accept than others, and I'm heartbroken over Judge T C.
Since he's gone, I've started looking at his sons. Request for Parole (on SRO) looks especially promising. The new-for-2008 grade I-winning stallion raced an impressive 51 times in 7 years, placing eight times in graded company, with earnings over $1.3 million. His broodmare sire is -- you guessed it! -- Deputy Minister. Request for Parole stands for the ridiculously-low price of $3,500 at Fox Tale Stud in Pennsylvania. I've also identified another Judge T C son who's still running, and who I'd love to see given a chance at stud one day. Four-year-old False I. D. (pedigree) has scored in a Saratoga allowance race and just took an AOC at Colonial Downs a week ago. He's got at least some stamina -- he's racing between 8.5 and 10 furlongs -- which is a big plus in my book. False I.D. is 3 x 4 to Secretariat, with another third-generation cross to Secretariat's full sister Syrian Sea, who is False I.D. 's third dam. It's neat seeing inbreeding to Somethingroyal, but this is a less usual instance (it is generally seen with Secretariat and Sir Gaylord). It's a long shot unless he suddenly starts scoring some black type, but with bloodlines like this, I would sure like to see False I.D. in the breeding shed a few years down the line. Okay, so who have I missed? What stallion do you miss who went abroad to a more appreciative audience? Let's say within the last 20 years or so.